FENGHUANG, HUNAN — So, there I was in a car, coming back from another trip to Fenghuang, when Billy Joel’s “New York State of Mind” emanated from the CD player. Two things make the soundtrack for this part of my life noteworthy. I was not heading back to Manhattan, USA, but to Jishou, China. (And, no, I was not feeling homesick, though the song is one of my favorites.) More importantly, the singer was not fellow Long Islander Billy Joel, but a woman with a soothing, sultry voice. Oh, I was hooked! After listening to the rest of the tracks, I had to ask who she was. Wáng Rùolín (王若琳), also known as Joanna Wang, is a Taiwan-based singer/songwriter in the Norah Jones mold. So far she has cut two CDs, and if her music gets more US airplay, Wang might just give Jones a run for her money. (Like Paul McCartney, one of her idols, Wang plays guitar left-handed, as you can see in this photo). Normally, I hate covers of my favorite songs. The originals get so stuck in your head that no other version can replace them. One possible exception would be Johnny Cash’s cover of “Hurt,” which is so good that even Trent Reznor likes it better than Nine Inch Nail’s rendition. Running into Wang was just one of my chance encounters with Chinese arts and music this past week. A few days ago, I finally watched a 1999 movie by Zhang Yimou, Not One Less (Yi ge dou bu neng shao 一个都不能少), which my students have been recommending since September. Yimou is more famous in the USA for his blockbusters like Hero (with Jet Li) and House of Flying Daggers (with Zhang Ziyi), but his films are not all wire-fu melodramas. Not One Less is a simple story about a young girl pressed into being a substitute teacher, because her poor village’s regular schoolmaster has to care for his sick mother. Barely out of primary school (5th grade) herself, she has to teach an unruly group of students in a one-room schoolhouse with only a well-worn text and 30 pieces of chalk. The title comes from the schoolmaster’s admonishment: he will pay her 60 yuan for the month’s work if she loses no students by the time he returns. She does lose two. A girl leaves after being recruited by a sports academy. A boy, whose father is dead and mother is ill, runs away to the nearest city, to see if he can find a job. The girl teacher goes after the boy with a tenacity that will bring tears to your eyes. And if you don’t reach for the tissue box by the time she makes a tearful plea to the boy to come home on TV, then your heart is made of stone indeed. The life of the girl who played the young teacher would make a good movie, too. Zhang used real villagers as actors, and most of the characters’ names are also their real names. Wei Minzhi (魏敏芝) was a 13-year-old village schoolgirl when she auditioned to play Teacher Wei; her ease in front the camera and natural acting ability brought her the leading role. After Not One Less became famous in China and across the world, Wei Minzhi’s life changed. Instead of living out the rest of her life in her tiny village, she was able to go a good high school, then to Xi’an International Studies University. An aspiring film director, Wei applied to the School of Directing at Beijing Film Academy in 2004, but was unable to win a place. 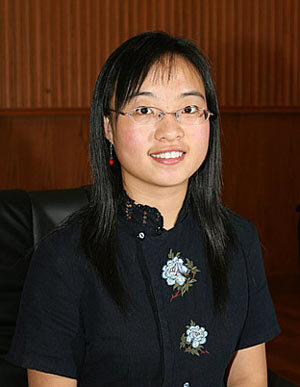 Soon afterward, however, a professor from Brigham Young University-Hawaii found her, and two years later, Wei became a BYU student on a full scholarship. So, here are my recommendations to sample some modern Chinese culture. track down Joanna Wang’s CDs and Zhang Yimou’s Not One Less. They will not disappoint. Joanna Wang’s new CD is not available from Amazon. Order it here. 对不起！ I have corrected my error. I just checked out Joanna Wang’s music on YouTube. She has a BEAUTIFUL voice! Most of the clips I listened to were really short songs – just her messing around and giving previews of songs she’d written…but I’d definitely be interested in hearing her full CD sometime. Yeah, her voice grabbed me right away. It’s a soothing contralto — not like the screechy pseudo-sopranos that dominate pop music. She has an independent streak, like Ani DiFranco, and the fansites say she was frustrated by the producers’ choices for the tracks on her first album. The second CD is supposed to be more to her liking. She also puts a lot of her own material on her YouTube site. Hard to say if she will go completely independent, like DiFranco. The situation in Taiwan is different than in the USA. Music buyers are more conservative on this side of the Pacific. It is such a wonderful recommendations . I love that part, which is "if you don’t reach for the tissue box by the time she makes a tearful plea to the boy to come home on TV, then your heart is made of stone indeed." Thank you so much for such kindness and truthful words. Thank yo so much for bring it up again. 谢谢, 敏芝！ And I am sorry I married you to the wrong guy. I have fixed the error on my blogsite.